These policies and Best Management Practices set out by Coastal Turf are for consumers to gain confidence in choosing their turf and ensuring that their new turf will create a quality lawn. 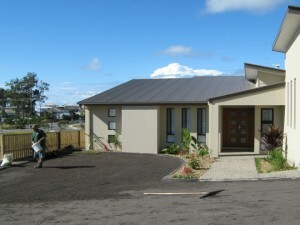 But remember we will send along an installation and after care guide for you to DIY. 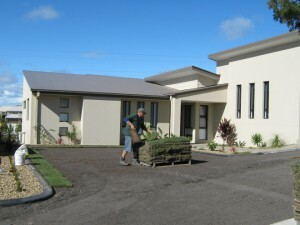 The quality of your site preparation will determine the quality of your new lawn. 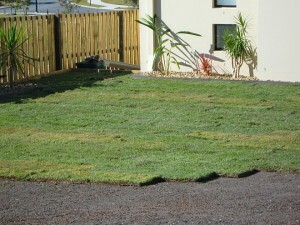 The flatter and smoother the area is before the turf is laid the higher quality your lawn will be. Prepare your area first. And then get in your turf. Spray (with Round Up or Glyphosate) all weeds. Remove all rubbish and debris (building rubble, cement and other materials that may be harmful to turf growth and development). Allow for a drainage management system within the turfed area (have a plan as to where any excess water will flow to). NOTE: Screened Organic Topsoil has chicken manure and compost incorporated into the soil mixture, often turf underlay topsoil is only a sand and loam mixture. The chicken manure and compost supply microbes into the soil, these microbes then break down old grass clippings inot organic matter and fertilizer for the grass. This means that your new turf does NOT need to rely on chemical fertilizers or water from irrigation once established. VERY WORTHWHILE! 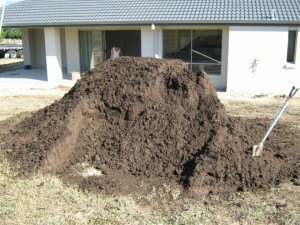 The amount and quality of your topsoil will have a DIRECT effect on the quality of your new lawn. Incorporate a minimum of 50mm (2 inches) of Screened ORGANIC Topsoil evenly throughout the entire turf area. Note: Any undesired rises or falls will be magnified by the turf and may result in drainage problems. To ensure the turf and any hardscaped areas are flush the topsoil should be approximately 25mm below the hardscape height. To measure the area or amount of turf (sqm) you require simply measure the length times the width. For example in the box below the length is 10m and the width is 6m, therefore the area or the amount of turf required is (10 x 6) 60sqm. NOTE: You can even use our on-line turf calculator! NOTE: Coastal Turf recommends a 4% wastage factor will be incorporated in all turf areas. This is because the minimum piece of turf used is to be 400mm x 400mm, the 4% wastage factor incorporates the lost turf in ‘cut-offs’ that are smaller than that. 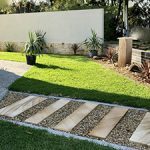 Take your time and select the right type of grass for your area, situation and needs (dependant on shade, traffic, sunlight, water requirements and maintenance). 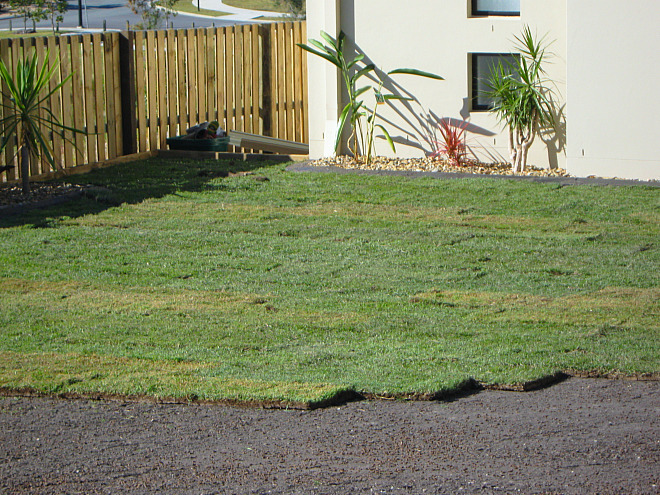 Selecting the most suitable turf grass variety will result in the best quality lawn. Our team will recommend the best lawn for your home based on the information you give us. 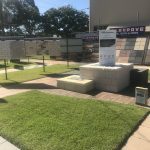 Or Contact US to get one of our Installers come not only help you make the decision on the best turf for your new Lawn, but take all the stress of the installation as well. 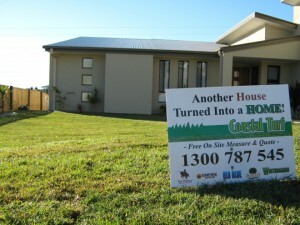 Installation of your New Lawn! Ensure there are no gaps between any of the pieces /slabs of turf. All turf pieces should be closely butted up with each other. It is best to lay the individual pieces of turf in a brick like pattern, this ensures that there is a leading edge to follow. The turf will be laid in sectors, ensuring that each sector maintains the desired preparation quality. This prevents the preparation of the site being destroyed by traffic (by both foot and machinery). Ensure that all turf has direct contact with the soil. The best way to achieve this is by rolling the turf with a turf roller. Irrigate/Water the turf for approximately 15 minutes within 30 minutes of laying the turf. 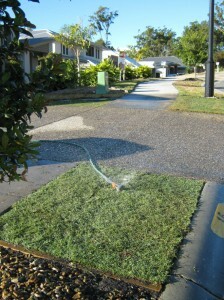 Irrigate/Water the turf after rolling, following Coastal Turf’s aftercare guide. Sit back, relax and enjoy your new lawn. Coastal Turf provides all of our customers with an establishment and ongoing care recommendation sheet with detailed information. 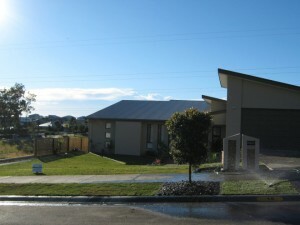 All customers should follow local council watering guidelines for the establishment period of the turf (approximately 14 days). When there is a good shower of rain it is very important to keep an eye out for lawn grubs. They often attack your lawn after rainfall as the grass is soft, lush and thick. But don’t worry, they are easy to control. Lawn Grubs left untreated will decimate your lawn. Get in touch with us to get a DIY guide or we can put you in contact with a Lawn Professional to eliminate the lawn killers. Click here for more info on lawn grubs. 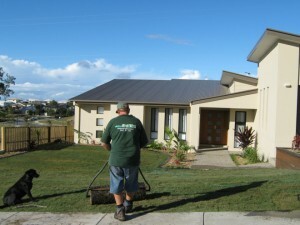 The single BIGGEST mistake that most Australian Lawn Owners make is mowing there lawn too low. The green part of your lawn is the part that absorbs sunlight and turns it into energy for the grass. When the lawn is mowed too low that green part of the lawn is taken away in the catcher. This means that the lawn has to draw on the reserves that it has stored in the roots. These reserves will only provide enough energy for the grass to recover once. If that lawn is then mowed down to low AGAIN, the grass has run out of reserves and begins to die off. Click here for more detailed info on Lawn Mowing Heights.